As a Key West resident, I LOVE the fact that That Turtle Story is set in Key West. There was a nice mix of “Oh, I know where that is!” and “Wait, does that place actually exist and can I go there for lunch?” moments as I read Nor and Eugene’s holiday romance. I adored how C.S. Poe managed to bring the quirkiness that is Key West, especially during the holidays, to life. That the two met and bonded over a turtle’s nest is perfect fodder for a future local legend, which merely adds to the realism of the story. Nor is perfectly adorkable as a mini-Christmas Grinch who’s trying to put a bad breakup behind him. That he finds his resolve to guard his heart and his personal stance on one-night stands tested by an ab-flashing tourist who’s concerned about one of the most important things in Nor’s life – a turtle’s nest full of unhatched eggs – is a delightful touch. Watching the two guys get to know one another over a handful of days and seeing just how enamored Nor becomes with Eugene kept a smile on my face for most of the story. While I’m not always convinced of the effectiveness of miscommunication as the main conflict in romances, in That Turtle Story it made complete sense on so many levels that I empathized with Nor’s failure to broach the subject. After all, if you don’t ask the question you’re not sure you really want the answer to, then you can keep on hoping things will work out and living on the corner of ignorance and bliss. Fortunately for Nor, Eugene is just as enamored with him and isn’t willing to let Nor walk away without a fight, especially when they have the perfect meet-cute story to tell their family and friend. And seriously, Nor is the cutest nickname and a shortened version I’ve never encountered before for his name – yeah, you gotta get the story to find it out for yourself. 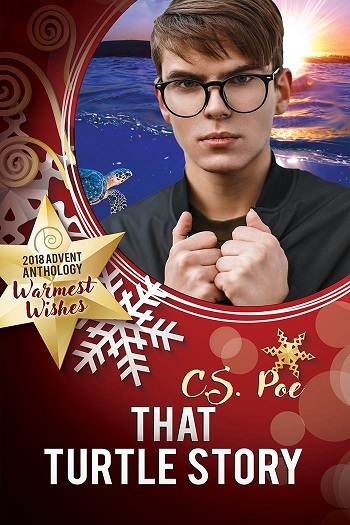 Reviewers on the Wicked Reads Review Team were provided a free copy of Warmest Wishes: That Turtle Story by C.S. Poe to read and review.